Ask fellow campers about "Sun Valley RV Resort (formerly Root 66 RV Park)" and nearby attractions. Shabby, run down place; all the buildings were boarded up. They are still listed on Passport America's web site; turns out they don't give that discount but offer a cash 'discount' of $35 (if check or credit card it would have been $43). We stayed here, in 2012, and found it a much better deal. Looks like the place is going out of biz. Stay some place else. We camped at Sun Valley RV Resort (formerly Root 66 RV Park) in a Motorhome. This is an OK park. It looks like a work in progress. We were in Site 1. Gravel and dirt and somewhat level. There is nothing around here. You have to go to Holbrook about 10 miles away. The flies were bad. But what was really bad is Site 3 had a bad water leak and it was like a lake at our site. They didn’t seem to concerned about that and our site was muddy. I was able to take a run on a road that is about 2 miles square. It’s ok for an overnight stay. We camped at Sun Valley RV Resort (formerly Root 66 RV Park) in a Fifth Wheel. My first impression of Sun Valley RV Park was "rustic", and then the second thought that came to mind was "a work in progress". After I got over my first impressions, I realized that this is really not a bad campground. It's a good location for an overnight - right off of I-40 or for a two day stop-over to visit Petrified Forest (17 miles away). The manager will try to place you in back of the "old motel" (back-in) to block the freeway noise. Surprisingly the "old motel" does eliminate most of the noise. There are (5) back-in sites behind the "old motel". Another two are not available. Most of these sites have 30 amp electrical services. There are a total of 6 sites within the campground that have 50 amp electrical services. The entire campground is on loose gravel. Some of the sites have a picnic table - no fire rings. The office has a lounge with comfortable chairs and a large TV. The water comes from a community well. The manager mentioned that they use the water for everything except drinking. The electrical voltage was good - hovering around 122 volts. The electrical pedestals were a mixed bag. Most were very low to the ground and usually attached to a rotted pole. There is only one bathroom available and no showers. The owner mentioned that they are working on constructing another bathroom but she did not know when it would be completed. WiFi was available but not usable. Verizon air card and cell phone reception was good. Overall, this is not a bad campground for a couple of days. We would come back to this campground if we were in the area. We travel with a 32 5th wheel. We camped at Sun Valley RV Resort (formerly Root 66 RV Park) in a Fifth Wheel. There is no one to supervise or secure the campground at night. The one person staff left at 4 pm. There was no WIFI until the next morning when she "rebutted" the system, and even then it was not connecting. She said to go to the office area it we could not connect at our site. We did that; still no WIFI. The park is titled "Resort" . . . what constitutes permission to give the title of "Resort" to this campground? Early evening as I was walking our dog, a camper pulled in and asked if it was "safe" to camp here! Dilapidated old motel rooms and half torn buildings still exist on the grounds. Pass this one by. NO . . . I don't think it is safe. And, the office doesn't even return your calls. We camped at Sun Valley RV Resort (formerly Root 66 RV Park) in a Fifth Wheel. We stayed here when it was Root 66 RV previously, and they definitely have made some improvements, though I wouldn't call it an "RV Resort." There is a nice cozy central room with TV, a store, and friendly staff. We didn't use the laundry or restroom facilities. The showers were "under renovation." The 50-amp pull-through sites are a bit farther away from I-4o, while the 30-amp sites are closer to the freeway and very noisy, which is the main drawback of this property . A 30-amp site was all that was available to us, but we were able to sleep. It was easy to pull into, and we stayed connected. The 30-amp sites don't have sewer; a dump station is available. It's mainly a big gravel lot with several groupings of sites close to each other, but they have made some aesthetic improvements to liven up the property. We didn't get any antenna TV channels, but we did get Dish and 4G on T-Mobile. It's a pleasant stopover at a good price and we'll stay here again if they keep the rates low. We camped at Sun Valley RV Resort (formerly Root 66 RV Park) in a Fifth Wheel. No services at this exit, you'll need to drive. Holbrook and some regional attractions like Petrified Forest are under a half hour away. Great spot off of I 40 close to the attractions Painted Desert/Petrified Forest. Owner very accommodating and very helpful. Gravel pull through very level. Would definitely stay again!!! We camped at Sun Valley RV Resort (formerly Root 66 RV Park) in a Travel Trailer. This is an older park with a very helpful new owner. The site was level and a very easy off/on to I 40. We camped at Sun Valley RV Resort (formerly Root 66 RV Park) in a Fifth Wheel. This park is located very close to the National Park. We stayed in the 50amp pull-thru section which was furthest from the highway so least amount of road noise. Behind our site was the remains of a building having been knocked down which seemed a little hazardous. It did appear they were making changes to update the park. We camped at Sun Valley RV Resort (formerly Root 66 RV Park) in a Motorhome. In other reviews, I saw that the water had a brown coloration so we came prepared to use the fresh water in our tank. We confirmed that the water was still brown. We stayed at Sun Valley RV resort due to its proximity to The Petrified National Forest. It was a great jumping off point for local excursions. The owners were very friendly and welcoming. When we extended our stay, we moved to a 30 amp site. We did not use their wi-fi but had great reception with AT&T. The park is undergoing some positive changes which will help it live up to the term "resort". Despite how close it is to the highway, I did not find the road noise bothersome at all. We would definitely stay there again. We camped at Sun Valley RV Resort (formerly Root 66 RV Park) in a Motorhome. Lots to do in the area! Petrified National Forest, Painted Desert, Route 66, Winslow, AZ. Take advantage of the community fire pit! This is not a resort by any means. Their reservation system is terrible. I made a reservation for 5 nights with 50 amp with the understanding that the first night would be only 30 amp. When we arrived the owner said that a mistake had been made and that we could have 50 amp the first 4 nights, but would have to move to a 30 amp site on the 5th night, just the opposite of what we were originally told. 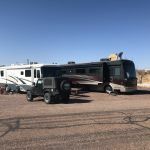 We agreed to this, but then on the morning of the 4th day, the owner told us there were two RVs coming in and since they were paying the full nightly rate, not Passport America rate, we had to move to accommodate them. We decided to leave and asked for a two night refund which the owner provided with resistance. The sites are so small the people next to us couldn't get out of their 5th wheel because we have 4 slides and there wasn't enough room. Elect/water/sewer worked fine. AT&T was good. Didn't use OTA TV channels. Owner saw our 2 small dogs and said that they have dog baths for $10 or $15 they provide soap & towels, but they had no hot water. For the PA rate, it was not worth it, IMO. We won't go back, and cancelled our return reservation there. We camped at Sun Valley RV Resort (formerly Root 66 RV Park) in a Motorhome. Must see Painted Desert/Petrified Forest. I didn't know you can take RV, parking areas have room for RVs. Heard Winslow is neat. Missed it because had to leave early. Nothing to see in Holbrook, only VERY expensive gift shops. Shops in Painted Desert/Petrified Forest were 1/2 the price. Right off I-40, pull through level site, full hookup, passport america rate, clean, older but nicely renovated under new ownership, satelite acces, nice dog run with bags and pooper scoopers, what else could you ask for for a one night stay We camped at Sun Valley RV Resort (formerly Root 66 RV Park) in a Motorhome. We stopped at Sun Valley using Passport America for a night on the trip home. We reserved a site in the 30amp section which, it turns out, are not the best sites available. Site widths are only 18 - 20' which are very close. There was plenty of length for truck and trailer. These sites are also on a sloping grade so leveling is necessary in several directions. Next time we would opt for the 50amp sites which were on higher, more level ground. Water pressure was good at 45+. 30a power was good. This park is right next to I40 and traffic is no more than 200' away so there is some road noise but surprisingly not that intrusive. The park is undergoing positive changes. There are elements of an older facility that was fairly run-down at one time but the owners are upgrading and improving as they go. The park was clean and free of the clutter that tends to proliferate in an older park. The offered Wi-Fi is satellite based and very slow. Our hotspot got four bars so we used it instead. OTA TV channel reception is non-existent so bring some DVD's. Overall, Sun Valley is a decent place for an overnight stop and we would stay again. We camped at Sun Valley RV Resort (formerly Root 66 RV Park) in a Fifth Wheel. The Petrified Forest, Painted Desert and "standing on the corner" in Winslow are all easy destinations from the park. This is a family owned RV park, not a resort, located between old Route 66 and I40. It is a work in progress. The new shower house was not yet completed. All the electrical has been replaced throughout the park. The clubhouse is more like a large living room with big screen TV and comfortable couches. It was available all night using the code. The laundry was accessible through the the clubhouse. Two washers/dryers plus the families washer and dryer were available for use. Passport America discount was available for the entire stay. I40 noise blocked by building in the back row but when we moved to the front you could hear the traffic. We stayed 2 weeks and will go back and watch their progress. We camped at Sun Valley RV Resort (formerly Root 66 RV Park) in a Fifth Wheel. Within easy driving distance to the Petrified Forest/Painted Desert and to Winslow to "stand on the corner". Jackrabbit Trading Post was a fun stop to look for souvenirs. Another family trying to keep Route 66 alive. No Walmart but Safeway near the WigWam Motel in Holbrook. This campground is nothing fancy but looks like the owners are trying to improve it. It is easy to get to and easy to get around in. We had a pull-through dirt FHU site. The utilities worked well but the Wi-Fi was slow and the signal was weak at our site. Our Verizon signal was also weak. The owner was nice and helpful. We would stay here again. We camped at Sun Valley RV Resort (formerly Root 66 RV Park) in a Motorhome. A very basic experience. Power, water, sewer, and WIFI worked fine for us (though we were warned WIFI might be problematic). Highway noise but it's flat highway in good condition so no roaring engine brakes or pothole banging rackets. Depends on what noise bothers you. Showers not functioning when we were here but we always use ours. Don't expect amenities and you won't be disappointed. Best suited as a quick overnight stop if you are OK with road noise. No trains, though. We camped at Sun Valley RV Resort (formerly Root 66 RV Park) in a Motorhome. Not close to restaurants or stores. Definitely see Petrified Forest National Park. Entrance is 14 miles north of the park. Get any petrified wood you want there. They sell it by the pound. Also have polished wood items for sale. Definitely visit painted desert and petrified forest. Well worth the side trip! Close to the Painted Desert and the Petrified Forest. We stopped here to visit the Painted Desert and Petrified Forest National Park, which is east on I-40 - a good day trip. Also across the bridge from the park on the right hand side the neatest knife store - they have such an assortment as to be mind boggling. Also down I-40 west is Winslow, Arizona, famous for Standin on the Corner in the song "Take it Easy" by the Eagles. 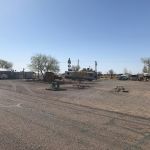 The town of Holbrook is close by for any shopping you might need to do. Conveniently located on interstate I40 and very close to Petrified Forest National Park. Safeway in Hollbrook. Propane on Navajo Blvd....best price on diesel at the Maverick on Navajo Blvd in Hollbrook. This is the closest camping for big rigs to the Petrified Forest. Also, this campground is called Sun Valley campground on Google Maps but the real name is Root 66. Support the small RV park owners when you can. Are you affiliated with Sun Valley RV Resort (formerly Root 66 RV Park) ?